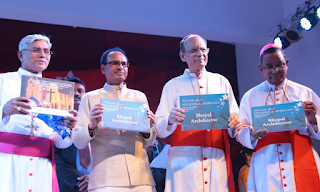 India: The chief minister Shivraj Singh Chouhan released a full colour Coffee Table Book on Archdiocese of Bhopal. The release of this much awaited book was held on the occasion of the Plenary Assembly of Conference of Catholic Bishops of India (CCBI). The whole process of conceptualizing, designing and publishing the book was done by the PR Solution. The event was graced by CCBI President Cardinal Oswald Gracias , Archbishop of Ranchi Telesphore Cardinal Toppo, different religions heads and Catholic Bishops, priests and religious people were present there. PR Solution is Southeast Asia’s leading Public Relations and Digital Media Group offering innovative results through 360 degree branding solutions. The coffee table book describes primarily the journey of the Archdiocese of Bhopal with respect to various Socio Humanitarian Initiatives taken and achieved. Archdiocese of Bhopal began a journey in 1969 continues with renewed vision in the service of the Lord and His people. This 56 pages Coffee Table Book kneaded tactfully, describing the rise of Bhopal Archdiocese and achievements of parishes and missions. This is a rare coffee table book that showcases the all the Ministries of Bhopal Archdiocese i.e Spritual , Faith Life, Education, Health Care, Relief & Rehabilitation, Socio Humanitarian, Women empowerment, Prison Service, Unprivileged Children, HIV/ AIDS, Youth, Public Relations and Interreligious affairs. This book also contains a brief history of Bhopal as well as the Archdiocese of Bhopal at a Glance. It reveals, how does Archdiocese of Bhopal pledge to eliminate leprosy, what steps were taken for Youth Animation, various programs on Relief and Rehabilitation of Unprivileged Children, Women Empowerment patient of HIV/AIDS, Prison Services etc. through a communicating print media coverage in the form of a coffee table book. Shivraj Singh Chouhan, Chief Minister of Madhya Pradesh appreciated the design and printing of coffee table book. He hoped that through this book the people will be able to come across various bonhomie programs, activities of the Archdiocese of Bhopal. He also congratulated the Archbishop Dr. Leo Cornelio for this whole idea and efforts done for betterment of society. Chief Minister Shri Shivraj Singh Chouhan said that affection and love are core of humanity. Archbishop Dr. Leo Cornelio, said that "The Archdiocese of Bhopal has already crossed the 50th year of her presence and mission in the heartland of India. I pray that God may shower his abundant blessings on each one of us, as we strive to grow in the love of God and become a truly vibrant community, responding to the lord’s call to the mission of reaching out to the spiritually and materially poor and needy of the Archdiocese of Bhopal. Coffee table book is also a step in that direction. Mr. S Vijay Kumar, Global Chief Executive Officer, PR Solution said that “Archdiocese of Bhopal coffee table book is packed with full color photography. We are delighted to be part of the Socio Humanitarian Initiatives of Bhopal archdiocese. The bonhomie activities of Bhopal archdiocese once known to common public through this engaging coffee table book, would surely inspire them to work for our society for its betterment. Presently the Archdiocese of Bhopal has about 75 diocesan priests, 70 religious priests, 20 religious brothers and 550 religious sisters working in the 26 parishes and 20 mission stations of the Archdiocese of Bhopal. Bhopal Archdiocese as a whole has 2 Colleges, 7 Pastoral Animation Centres, 3 Nursing Colleges, 49 Schools, 13 Hostels, 5 Social Welfare Centers, 5 Hospitals, 5 Dispensaries, 5 Professional Training Centers, 5 Schools for the Physically and Mentally Challenged, 4 Communication Centers and 3 Hospices. The Archdiocese of Bhopal is blessed with the gifted leadership of the archbishop, the dedicated service of the priests as well as the religious and the deep rooted faith life of the laity.